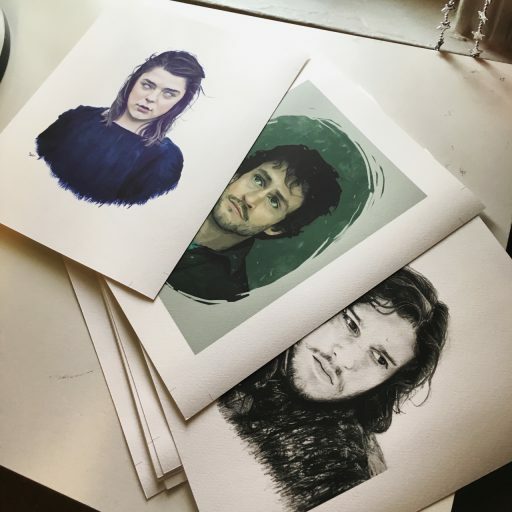 My name is Samantha Gray, and I love drawing fan art. I grew up obsessively watching movies and TV shows, and drawing all of my favorite characters from them. Not much has changed since I was a kid – I still draw fan art all the time. Movies and TV have inspired me to be creative and expressive in my own way, and I hope to share that with you through my website. I currently design newspapers for a living, and draw in my free time. I live in southeastern Pennsylvania and I like Chinese food too much. This website will feature all of my completed art, as well as my stupid commentary for each piece of art. I also have a blog that you can follow here to keep up with my works in progress and other nonsense. I’m here to share my work, but I’d also like to note a few artists that have inspired me. This list will definitely grow as time goes on, but for now here are a few artists that I’d recommend checking out to anyone who loves to draw or just create in general!